I recently completed my annual summer reading of Ernest Hemingway's The Old Man and the Sea. It may just be me, but I cannot escape the Christ-symbols inherent to Hemingway's Santiago character. But it's not just me. Others smarter than I am also see these outright Christ-references. Carlos Baker, in his book Hemingway: The Writer as Artist (4th edition) has an informative chapter titled "The Ancient Mariner" and Baker definitely holds that Hemingway purposely created not only a Christ figure, but sees the novella as a "parable." Santiago's name (Saint James--a fisher man), his "faith," his time at sea (3 days), his bloodied hands (stymata), his prayers, his dreams of lions (a biblical figure), his sense of identity and purpose (mission), his battle with "evil" (the shark attacks), and most evidently the final scenes with Santiago carrying the skiff's mast and sail (cross-shaped) on his shoulders and falling beneath it as he struggles to get to his shack. How can we not believe Hemingway's intent after reading a sentence like this: " 'Ay,' he said aloud. There is no translation for this word and perhaps it is just a noise such as a man might make, involuntarily, feeling the nail go through his hands and into the wood." The literary question is: Did Hemingway purposely craft Santiago as a Christ-figure? Or, are these symbols just part of his good story with no authorial intent to point to Christ? Opinions divide here. I am of the opinion that Hemingway's Santiago was intended to be a Christ-figure (affirmed by Carlos Baker). Could it be that Hemingway is telling this story to let us know that, in his view, Christ has failed? That whatever Christ did in his great, self-sacrificing work, it is all undone by the sharks? If Christianity is anything, according to Hemingway, it is a pitiful skeleton rocked by the waves of the sea near the garbage bins, misunderstood by the ignorant woman and man sipping their drinks on the Terrace. Very interesting notion, John. I'm no Hem expert, and I can't claim to know his underlying motivations, but if I had to hazard a guess, I'd say the analogy is deliberate, as is the perspective of failure. My sense is that he was more pessimist than optimist in his view of life, and after. Would be interesting to read FL Bob's view on this. Whether it is reflective of his personal faith or not, it is very possible that Hemingway used elements of the Biblical narrative and especially of Christ's passion in weaving his tale. After all, the Gospel is a VERY compelling story. Every time I read this book I see more of the Christ analogy. I do think it was purposeful on Hemingway's part. I do think Hemingway abandoned his evangelical roots and became an atheist. Read his very short story "A Clean, Well-lighted Place." Yet, he evidently knew the literary power of Christ's passion. Hey John, you're writing about my favorite piece of fiction ever, so I have to comment. Hemingway himself stated that the story of "Old Man..." was entirely void of symbolism. Any that we find, he said, you are just making up. He stated that the entire story was nearly true; in fact, the original "Santiago" was a real man, and his name was "Fuentes." To show my further devotion/obsession to Hemingway, a picture currently hangs in my basement of Hemingway and Fuentes. Fuentes died a few years back at the age of 99; I believe Time wrote a blurb on it. Intended symbolism? No, but that doesn't mean there isn't a coincidence that can't me quite meaningful to one of us! Try as I may to believe that Hemingway did not intend to "mean" anything with the very evident Christ symbolism in the story, the symbols are so artistically crafted that I can't imagine them being denied. The symbols are there, so how can Hemingway state that the story is void of symbolism? See Carlos Baker's chapter on the story. I don't know about the Christ imagery. I read ToMatS when I was 11 years old, and it profoundly influenced my worldview. Up until that time I had been exposed only to fiction that ended triumphantly when the fisherman caught the fish. Hemingway's story showed me that catching the fish is only the beginning, and the world is full of sharks. Carlos Baker in his *Hemingway: The Writer as Artist* (4th edition) was aware of the Time magazine interview you referenced and even quotes Hemingway from the article. Yet, with all that said, Baker still contends the Christ symbols are intentional. Have you read Hemingway's "A Clean, Well-lighted Place" and "The Short, Happy Life of Francis Macomber"? Two great short stories. I think that the symbolism was intentional. Hemingway was too good of an author for it to be accidental. Mark Twain said in the foreword of Huck Finn that there's no meaning or purpose in that novel, and anyone who tries to find meaning in the story needs to be shot. But try telling that to any HS lit teacher. It's obviously not the case. I too think the symbolism was intentional but for different reasons. I think the book is the ultimate ego trip. 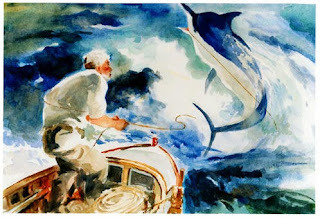 Hemmingway is the marlin and all of our attempts to understand him and try and catch him and match his human capability is frivalous and cannot happen. We can only hope to skim the surface and try and reel him in. And it goes so far as to say that not even Christ himself can reel him in. I actually do not believe Santiago is a Christ figure in this novel. You can make some symbolism work but there is some symbolism that makes no sense. Why does he need a boy to help him even eat? Named Manolin (Emmanuel)nonetheless. Santiago's pupil is named Redeemer? Why does he dream of Lions? Shouldn't he be the Lion? Hemmingway is telling us that he is too smart and too deep for anyone of us to handle or comprehend. Hemmingway himself is quoted as saying this novella "is only the tip of the iceberg." But that is the beauty of literatue. I do think Hemmingway had a massive ego, so you may be on to something. If I had to guess, I would say it's both. I don't think he sat down to write a meaningless story and somehow all this meaning popped out. I also don't think he sat down intending to write a story with a Christ metaphor in it. I think he more or less sat down and wrote from the essence of his being, and The Old Man and the Sea is what happened to come out. I can't speak for all fiction writers, but I know for myself, I tend to think in stories. I don't always know why I'm writing something, other than it just seems right. It's not until the story is finished that I can finally see how it fits in and why it had to be there. I can also say that, as an author, it can be very painful to have someone analyze and dissect and categorize your story. I would have intense feelings of anger towards anyone who read my book and boiled it down to a simple metaphor. I think it would be very akin to chopping an artist's painting into two inch squares and analyzing it. The thing I love most about my stories isn't how cleverly I incorporated deep metaphors into my work. It's the little personality quirks I give my characters. It's the beautiful scenary I describe. I spent eight months creating this whole world. And I want my readers to enjoy that world, to love it. Not analyze it and find some analogy. Some authors are like you, BJ, and some are like Hemmingway and others like Steinbeck and there are even others like Dostoevsky. They do have a massive ego or they do have an agenda to push or they have a deeper meaning in thier works to get across to you, the reader. That is the beauty with writing, fiction, poetry, or to boil it down, the printed word on the page. Each author is unique and each reader is unique. Oh, that's true. I didn't mean to imply I was speaking for Hemmingway, only myself. I also didn't mean to say I don't have a deeper meaning in my writing I'm trying to communicate, because I do. All I mean is that everything I put into my story is there for a reason, even if it doesn't advance the plotline or add to a "deeper meaning". And if my reader was to extract the deeper meaning from my story, I'd have to say he or she didn't understand the story. Maybe parts of the story, but not the whole thing. Like Dustin Hoffman says in I Heart Huckabees. It's true, but it's not the whole truth. But, maybe, like you say, Hemmingway was different. Maybe the details of his stories were insignificant to him. Never met the guy. He probably wouldn't have bared his soul to me anyways. I'm happy to listen in on your e-conversation. BJ, you worote, "All I mean is that everything I put into my story is there for a reason, even if it doesn't advance the plotline or add to a 'deeper meaning'". I think Brian and I and many others wonder "Why did 'Papa' put *that* in there at this place in this way?" It's not so much to slice and dice the work as to get into its impact. If TOMATS makes a great impact on, let's say, me 'Papa's' use of Christ metaphors, am I supposed to cavalierly say, "Oops, that's just a by-product of the story. Papa really didn't *mean* for that to happen?" That I just can't believe. The words are there--in black and white...for a reason. "If TOMATS makes a great impact on, let's say, me BECAUSE OF 'Papa's' use of Christ metaphors/SYMBOLISM, am I supposed to cavalierly say, "Oops, that's just a by-product of the story. Papa really didn't *mean* for that to happen BY HIS USE OF THOSE SYMBOLS"? It occurs to me now that my therapist is a very brilliant man, and that our brains probably work in very different ways. I have been somewhat arguing that Hemingway thought like I do, and you have been somewhat arguing that Hemingway thought like you do. I will concede the arguement to you since I know nothing about Hemingway beyond the stories I've read. I understand the odds are like 2 to 1 in your favor anyway. This is a story of an old man who hasn’t been able to catch a fish for last 84 days. People start calling him “Salao”, worst form of unluck and make fun of him. A young boy believes in him and goes to fishing with man as he believes there’s a lot to learn from old man. Although he has to go for fishing with some other guys at end because of his parent’s will but he’s unhappy about decision and wants to be with old man. On 85th day old man goes alone and he catches a fish (which turns out to be a giant fish). Story turns around then when man has to spend 3 days in water and fish is not giving up to be caught. Old man eats small fish this time and he gets bruises in his hands. He thinks he’s going crazy and asks to be clear in head. He has slept very less. He talks to fish and consider him brother. How old man saves himself and fish from sharks. To me this is a story where author has tried to explain how we constantly keep on fighting and explaining our inner friend/enemy. Where we explain why we did this, especially wrong and how much it matters to our lives. This is not just about my happiness or your hurt but many others whom we are treating.